Pope was not the only one to shatter a big record on the 11th day of the tournament. 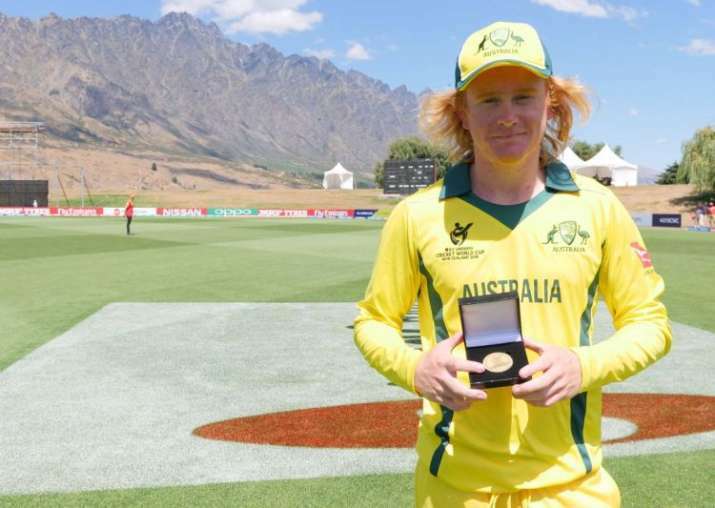 Australian leg-spinner Lloyd Pope claimed a record spell of 8/35 during a quarter-final match at ongoing Under-19 World Cup, best ever figures in the history of the mega event on Tuesday. With his remarkable spell, Pope propelled Australia to the semi-finals of the World Cup. The 18-year-old leg-spinner broke the record set by teammate Jason Ralston, who took seven wickets conceding just 15 runs in an Under-19 World Cup match against Papua New Guinea, just three days ago. Lloyd's bewildering spell of 9.4-2-35-8 turned the game on its head as England were spun out for 96 in 23.4 overs after being 47 for no loss in the eighth over while chasing 128 for victory. The astonishing effort ensured Australia captain Jason Sangha's fighting 58 did not go waste for the three-time champions, who now await the winner of Thursday's quarter- final between New Zealand and Afghanistan to know who they play in the first semi-final on January 29 in Christchurch. This performance was also second to former India fast bowler Irfan Pathan's nine for 16 against Bangladesh at the Gadaffi Stadium in Lahore in 2003 in all U-19 matches to date. In one of the two plate quarter-finals of the day, Sri Lanka opener Hasitha Boyagoda slammed a stroke-filled 191 to establish a new mark for the highest individual score in U-19s to help his side beat Kenya by 311 runs. In the other quarter-final, half-centuries by Nyeem Young, Bhaskar Yadram and Emmanuel Stewart helped the West indies overpower Ireland by four wickets. In the Super League quarterfinal of the day, Australia elected to bat but were bowled out for 127 in 33.3 overs with skipper Sangha waging a valiant battle. Sangha struck seven fours during his 91-ball 58 and was the ninth man out. Australia were tottering at 86 for seven when Sangha put on 36 runs for the eighth wicket, the highest partnership of the innings, with Zak Evans (12). Opener Max Bryant (16) and Nathan McSweeney (10) were the other Australia batsman to reach double-figures. For England, fast bowlers Dillon Pennington (three for 27), William Jacks (three for 21), Ethan Bamber (three for 31) bowled beautifully and exploited the conditions well. Pennington provided England a near-perfect start when he removed openers Jack Edwards (3) and Bryant with Australia's scorecard reading 22 in the fourth over. Bamber then picked up first of his three wickets when he dismissed Jonathan Melo (4) as Australia slipped to 27 for three. The 1988, 2002 and 2010 champions slid into further trouble when Pennington accounted for Param Uppal (0) with the scoreboard showing 28 for four in six overs, which soon became 59 for five in the 13th over with the fall of Will Sutherland (4) who was Bamber's second victim. With half the side back in the hut, captain Sangha took control of the proceedings and gave his bowlers something to bowl at by carrying his side to 127 in 33.3 overs. As it turned out, the total proved to be enough to go for the kill. Defending a modest score, Sangha bet on the right bowler to do the job for him. He got Pope into the attack in the sixth over of England's innings and the leg-spinner obliged his captain by drawing first blood in his second over when he had opener Liam Banks stumped. The dismissal of Banks, who was a sleeping partner in a 47-run first wicket stand with Tom Banton, opened all floodgates as Pope turned almost unplayable. There was a time when it seemed Pope would pick up a wicket at each delivery as England batsmen were completely at sea and struggled to pick his variations. After Pope sent back Banks (3), Harry Brook (0) and Will Jacks (1) to leave England in a bother at 51 for three, Banton and Wood (8) got together and repaired some damage by taking the score to 71 for three after 13 overs. But the end of Banton's cautious but aggressive 53-ball 59 also started the end for England as they lost their last seven wickets, five to Pope, for 25 runs in nearly 11 overs to be skittled out for 96 in 23.4 overs. Apart from Banton, who hit seven fours and three sixes, wicketkeeper Jack Davies with 11 was the other England batsman to reach double-figures.